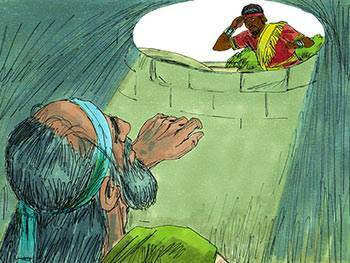 This is a story of a black helper who lived in Jerusalem. You perhaps would not have expected to find a black man in Jerusalem, but Ebed-melech was an African servant in the king’s palace. Sometimes one of God’s servants, whose name was Jeremiah, would come to see the king. Jeremiah used to tell the king the words that God spoke to him. Often the king was angry at these words. And the princes were angry too. 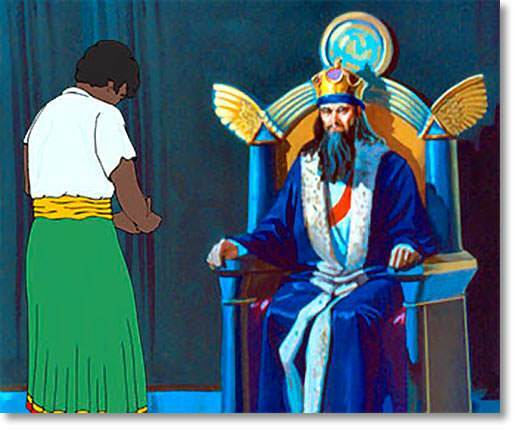 The princes tried to stop Jeremiah from speaking to the king or the people. 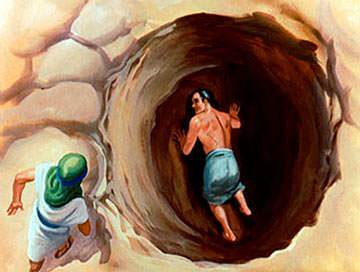 They persuaded the king to let them put Jeremiah in a place where they thought he would die. It was an empty cistern or pit. This cistern was used for storing water, but was now empty except for horrid thick mud at the bottom. 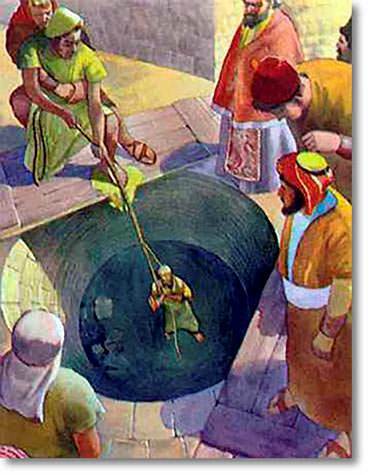 Poor Jeremiah was let down into the cistern with ropes. He was weak and ill, and he sank down in the mud. Ebed-melech heard what the cruel princes had done, and the kind, black man was very angry. He was so brave that he went to the king himself about it. 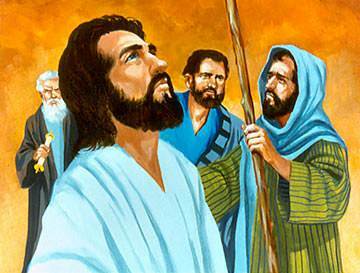 He said, "My lord the king, these men have done very wrong in all that they have done to God’s servant Jeremiah. He will soon die of hunger where he is." 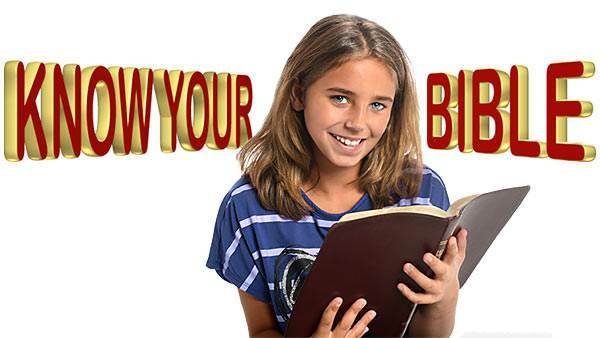 Then the king commanded Ebed-melech, saying, "Take several men with you, and lift up Jeremiah out of the cistern before he dies." 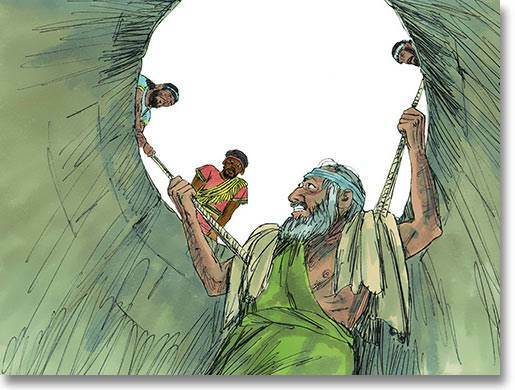 So Ebed-melech chose several helpers and got some strong ropes and some rags, and let them down to Jeremiah in the cistern. The kind black man said, "Tie these soft rags under your arms so that the ropes will not hurt you. Then fasten the ropes under your arms and we will pull you up." Then Ebed-melech and his friends pulled, and pulled, ever so carefully and steadily, till Jeremiah stood once more on the ground in the fresh air. Both Jeremiah and Ebed-melech thanked God that he was free.